As the film opens we are plummeted right into the anxiety and adrenalin of being prey. Fugitive Roy Tomlin (Michael Shannon), his son Alton Meyer (Jaeden Lieberher) and state trooper Lucas (Joel Edgerton) are hiding out in a hotel room. Obsessively tracked by the FBI, police and aggressively hunted separately by a doomsday cult led by Calvin Meyer (Sam Shepard) they are preparing to run for another night. Their destination, specific coordinates on a certain date foretold by the supernaturally gifted Alton. 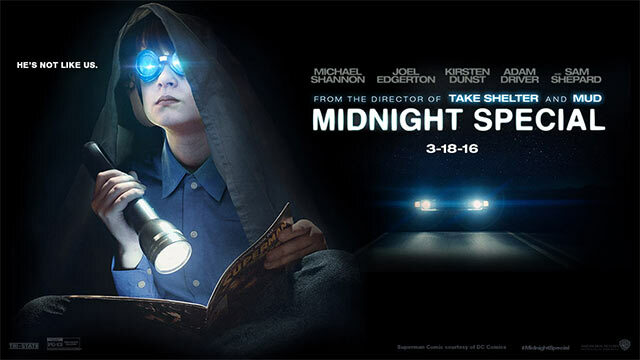 Shot over 40 days for 18 million dollars, MIDNIGHT SPECIAL Writer/Director Jeff Nichols proves that 200 million dollar budgets are not needed to make high concept works of imaginative vision. No surprise really for those who have been tracking Nichols career since his debut micro-budgeted gut punch melodrama SHOTGUN STORIES. Nichols has the magic touch that can subvert a genre film into something more humanized by telling large scale stories focused on how they affect the individual. TAKE SHELTER is the apocalyptic thriller that’s really a nuanced drama about metal illness, marriage and mortality among other themes. MUD is the convict on the run Southern pulp flick that’s a coming of age, getting of wisdom story with other aims. 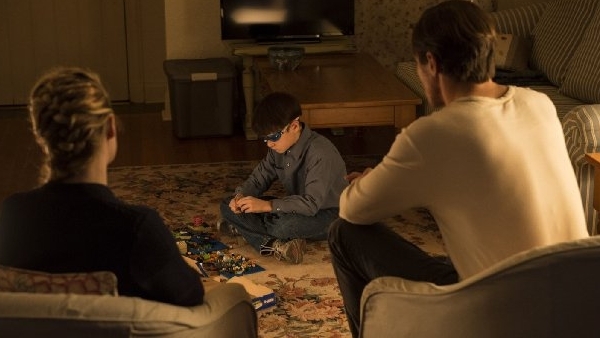 In MIDNIGHT SPECIAL it’s the dynamics of the family relationship at the heart of the story that injects the emotional nourishment. The smart lean exposition evading screenplay demands engagement. It’s what isn’t said and the strong performances that make the characters richer and gives this thrilling drama a modulated momentum that’s deliberately paced to not sacrifice quiet, reflective moments or tension. 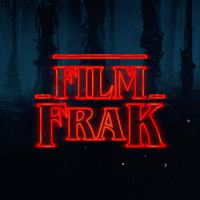 Flashback free, treating the audience with a respect that allows the viewer to participate in clues to construct the backstory. The forward drive of the narrative never looking in the rearview mirror for more than a glance as the mystery unfolds as organically as the character motivations. The twinkling synthesized, foreboding of the score by David Wingo (Take Shelter, Mud) harkens back to the 80s, but like the film itself, the music is not a carbon copy of the past. Both contain a contemporary freshness and individual voice that manifests a distinct personality. There is an ethereal quality to some of Adam Stone’s (Take Shelter, Mud) cinematography that also adds velocity, intimacy or scope to any given scene through close up or wide shot. As the resourceful father determined to protect and deliver his son Michael Shannon, (MUD, TAKE SHELTER) again shows every dimension of his character. His malleable presence lets the flaws show with a range from daunting to vulnerable. Playing off that energy 14 year old Jaeden Lieberher (Aloha, St. Vincent), performs on his own frequency with an impressive otherworldly air of wisdom and calm. There’s an acceptance of circumstances beneath the surface that none of the other characters carry. The sometimes underestimated Kirsten Dunst (Melancholia, Virgin Suicides) proves to be a good fit for the films tone, her previous appearances in Amblin like 90’s family films (Small Soldiers, Jumanji) contributes to atmosphere. She also brings a weary earthiness to the part of Sarah Tomlin that’s an effective use of silence. Adam Driver is just so fun to watch. He’s got that Jeff Goldblum aura of eccentric facial mannerisms and deliberate expressions. As Agent Sevier, the FBI “expert” filled with intellectual curiosity and potential understanding Driver plays a surrogate to the Truffaut role in Spielberg’s UFO and mash potatoes wish upon a falling star. The film does lag slightly in the final act once the primary mystery is revealed but the emotional weight of events takes over for a satisfying sense of wonder. It may not quite reach all those profound heights but by shooting for the stars MIDNIGHT SPECIAL enveloped me right from the opening black frames as a television news report broadcasting exposition nods the past all the way through to its cathartic finale.